Choose From a Variety of West End Hotels! 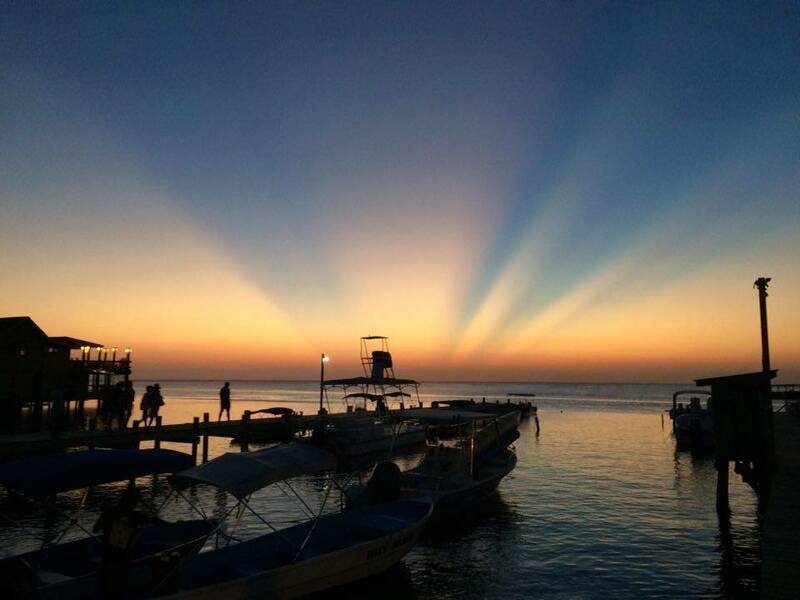 West End is arguably the most popular area in Roatan. 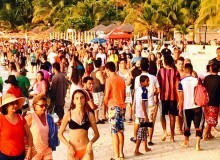 This is truly a beach town with lots of action and with something to fit everyone’s taste, from restaurants, bars and hotels. 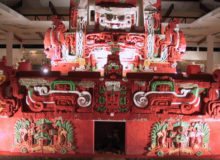 Following is our selection of top West End Hotels. 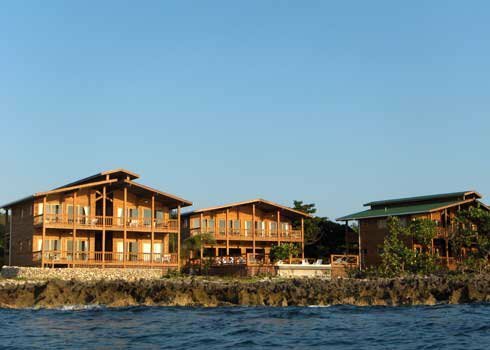 Coco Lobo Resort sits on the iron shore facing due west. Great property! Located on the north side of West End, right on the beach, Cocolobo offers 10 large, comfortable rooms with a balcony or terrace, each of them with an ocean view. The balcony or terrace features outdoor furniture as well as an inviting hammock, and you will do doubt enjoy the sunsets from the comfort and privacy there! A nice pool will give you a chance to cool off and see the surf breaking on the iron shore in front of Coco Lobo. Service is outstanding, and this is one of the best spots on the island if you are looking to be pampered and treated like royalty. 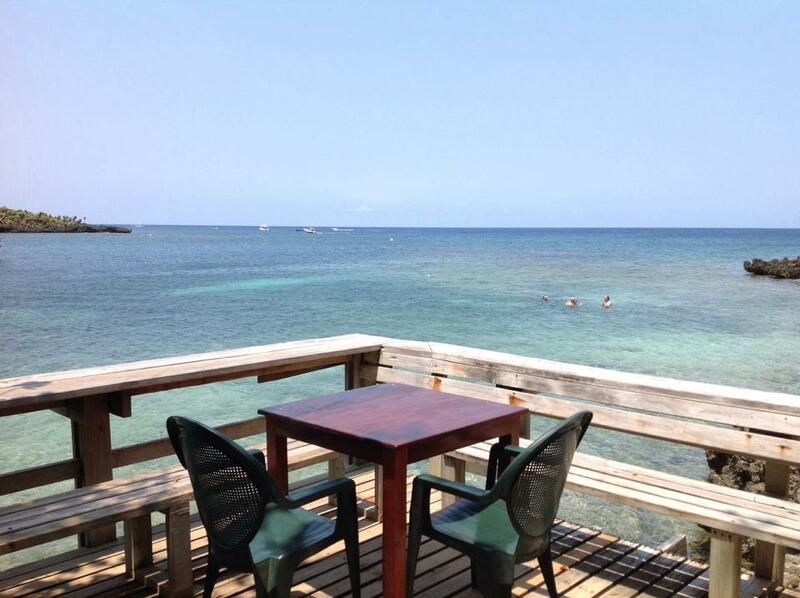 Diving and snorkeling are all easily available in Cocolobo. 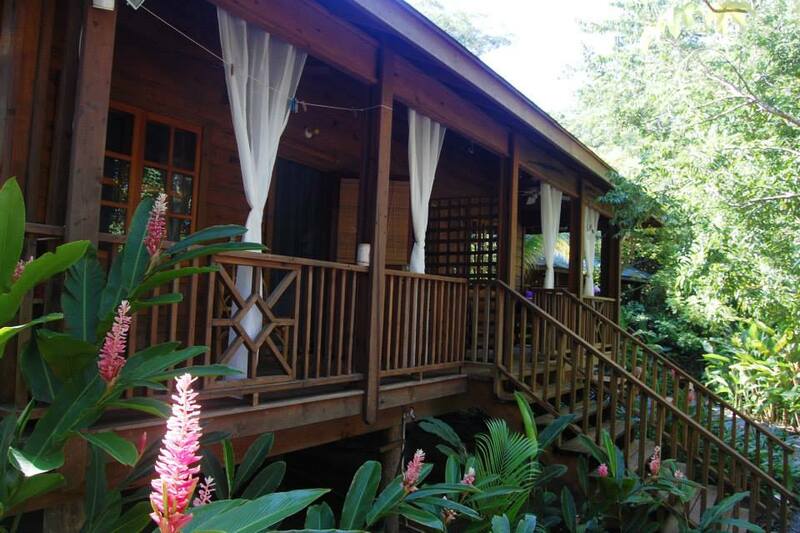 Rooms have air-conditioning and a safe, as well as complimentary wifi service for guests. This is one of the best West End Hotels! A small intimate resort located on the water, facing the north side of the island. Although there is no beach here, there is a nice saltwater pool built on the iron shore, giving you a great view of the ocean and allowing spectacular views of the sunset. Lands End Resort offers different rooms with diverse capacity, from a bungalow to a king size room, with intermediate facilities. There is a room that is perfect for you. All offer great ocean views. Sea Grape Resort has been around for a long time, and it keeps getting better. More like a small village, with self contained rooms spread out over the property in a lovely gardened setting, with, yes you guessed, lots of sea grape trees within it! The seagrape, also known as “Icaco” is a local tree that looks a bit like an almond tree, grows very well on sandy soils, and provides lots of shade. 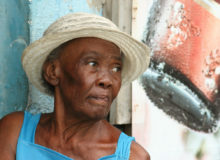 Seagrape is located on the far north side of Roatans West End community, with easy walking access to the different restaurants and bars in West End. View from the top floor at Posadas Las Orquideas. 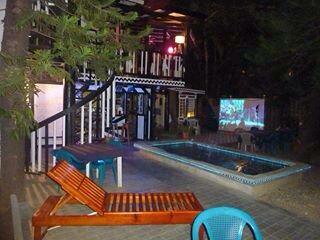 Posada Las Orquideas is located on the north side of West End, facing Mangrove Bight. Although it is ocean front, it does not have a beach to swim in, however the beaches at Half Moon Bay and West End are but a few minutes away walking through a pleasant, very safe community. With a total of 18 rooms, some of which are studios with kitchenette, and with an option for air-conditioning, ceiling fans or both in your room. 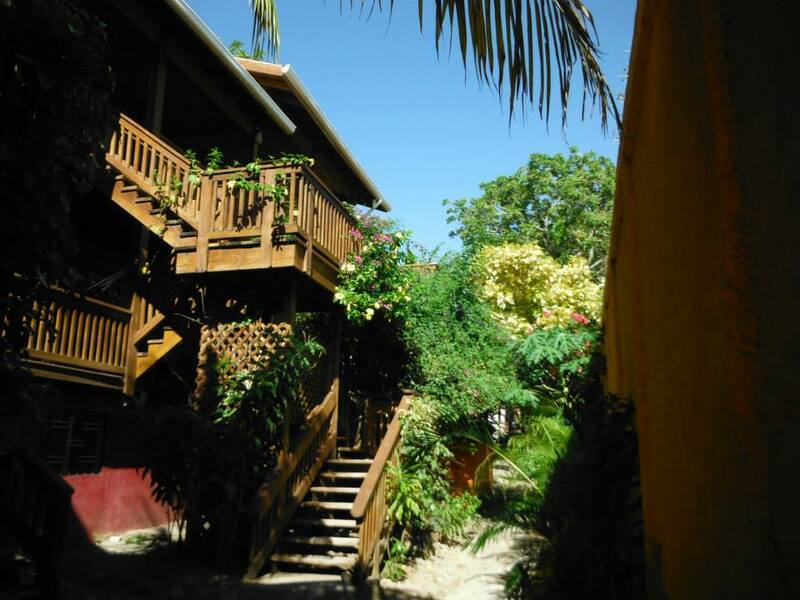 Posada Las Orquideas is a pleasant place to stay in, where you will find comfort and friendly service. A lovely guest house located in West End, on the detour towards Half Moon Bay Cabins. Offering three rooms, each individually appointed, with a private entrance and of course a private bath with all the amenities. A tropical garden setting offers a pleasant setting for their restaurant. Close to all the restaurants and bars in West End, yet in a quiet neighborhood where you will not be molested by the active night life in town. The Lilly Pond House is a true boutique bed and breakfast in West End. 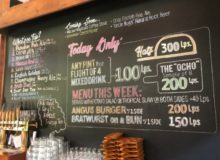 They also offer a nice restaurant with a short, but tasty menu that you will surely enjoy. Located in the heart of West End, and offering a complete range of services, including one of the best restaurants in West End, a full service PADI dive resort facility and 25 comfortable spacious rooms with all the modern amenities you would want. 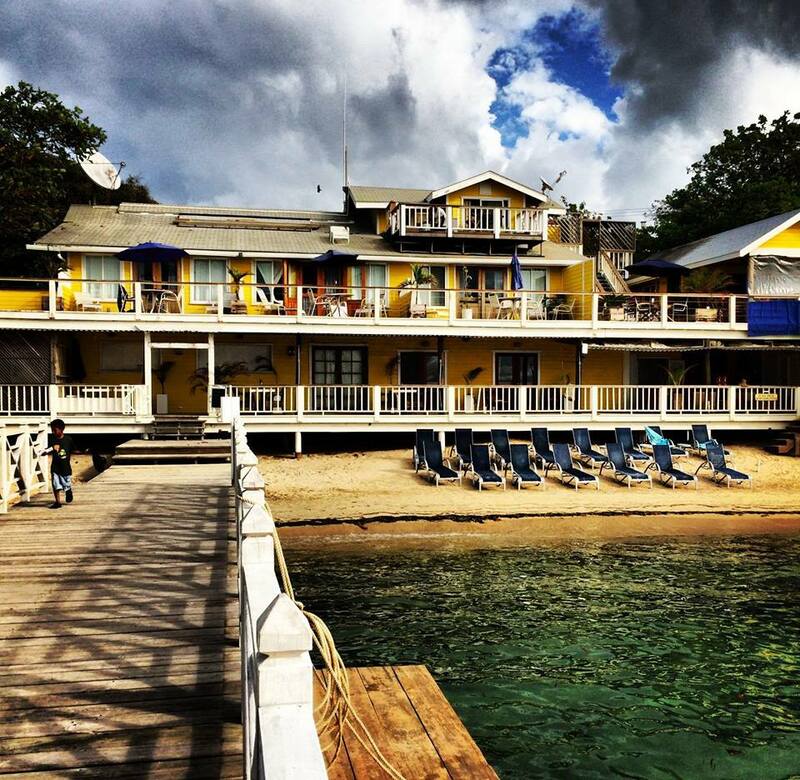 Splash Inn was originally designed and built by an Italian couple who gave the property a nice mix between a local Caribbean architecture and an old fashioned Mediterranean feel. The result is a great place to stay in. In the old days, the resort was called “Pura Vida”. The property also boasts a good restaurant and pizzeria. Located on a small hill behind Spash Inn, Mariposa Lodge offers a variety of different rooms, including apartments with or without a/c, hotel rooms and even a three bedroom house. 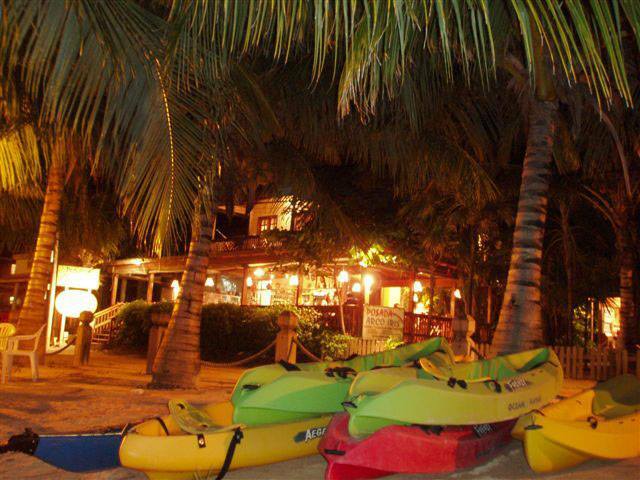 Although not on the water, it is very close to the beach and to the different restaurants and bars in West End. The Beach House Boutique Bed and Breakfast as seen from the dock. A beautiful home with only 8 suites located right on the beautiful beaches of Half Moon Bay. The Beach House gives you outstanding access to all of the amenities of West End, with a variety or restaurants and bars located within walking distance. 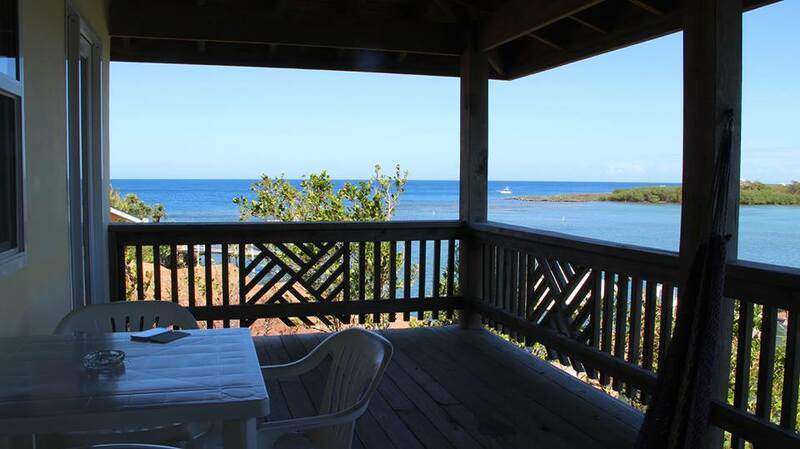 Ideal for snorkeling, fishing, relaxing on a hammock and enjoying the lovely views of West End. For a comfortable homey feeling, with great service, this is the perfect spot! 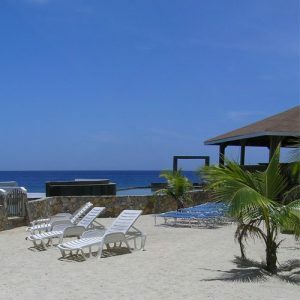 This is certainly the premier beachfront boutique bed and breakfast and West End Hotels. 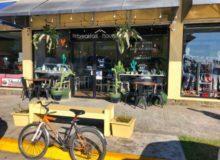 Although technically not on the beach, Posada Arco Iris is just across the street from the beach, and offers chaise lounges and chairs to their guests right on Half Moon Bay Beach. A nice island style wooden building offers good, clean rooms. The hotel has one of the most popular street-side restaurants in West End: The Argentine Grill, serving great steaks and churrascos, Argentina style! 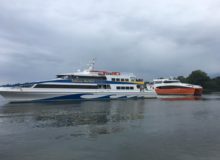 Facing the tranquil waters of Half Moon Bay, and with direct access from the beach to the reefs for outstanding snorkeling, the location of Half Moon Bay is truly unique. Just off the hustle and bustle, but only a short walk to the different restaurants and bars in West End. 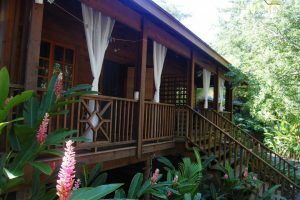 The property offers a variety of cabins. Rooms are all ocean front, with a nice balcony with a hammock and ocean view. Private bathroom, air conditioning and wifi are all standard. 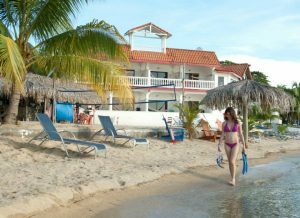 Located on the south side of West End, Sueno del Mar is a nice beach front property that is home to Roatan Dive Center, a PADI 5 star dive center where the owner and dive Master, Ray, is a friendly chap who works hard to keep his guests happy. 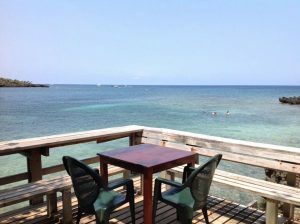 A small beachfront bar is a great place to hang out and enjoy the sunset and exchange tales of your diving experience. The resort boasts 8 lovely rooms, each with a private balcony overlooking the Caribbean Sea. Rooms boast all the modern amenities and comforts you would expect. 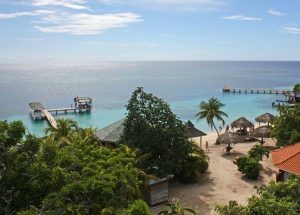 Located at the South tip of West End, Hotel La Quinta Inn Roatan is a wooden structure that offers a variety of rooms. 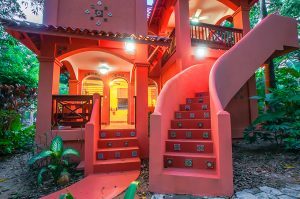 This is a great budget location that is close to the beach, to the restaurants, bars and night life in West End and offers a pleasant island feeling to it. 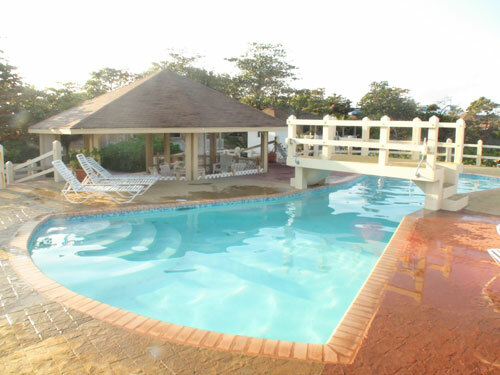 Although the hotel is not on the beach, and the pool it has is rather small, it is only a couple of minutes away from the beautiful beaches in West Ends south corner. 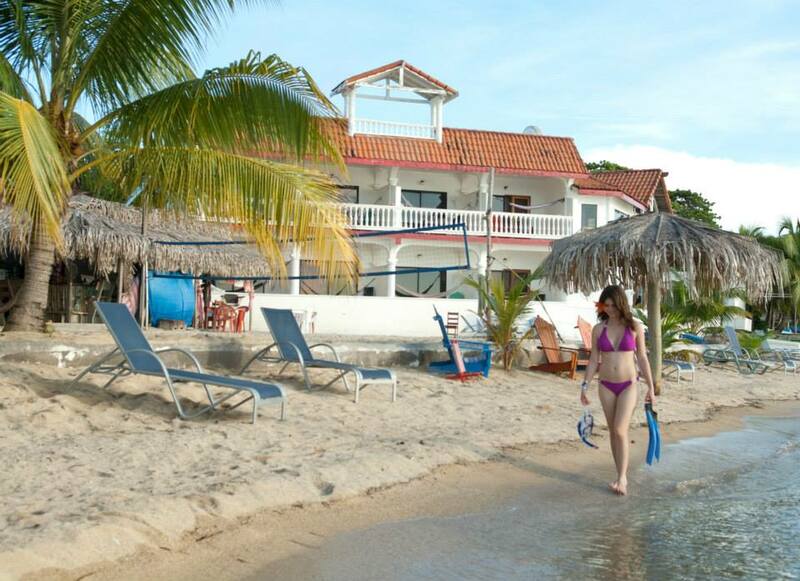 Located right on Half Moon Bay, Chillies offers a variety of alternatives, that go from dorm beds to private rooms, private one and two bedroom cabins and studio rooms. You will find the perfect accommodations for you at the right price. It’s location is unbeatable, with easy access to all the different restaurants and bars in West End, as well as to the lovely Half Moon Bay beach. Probably one of your best options in West End. Although not on the beach, it is just across the street from it, and you will have easy access to everything from its convenient location, including public transportation throughout the island. Sea Breeze inn offers a variety of tours and activities, a great bar and light restaurant, the Cannibal Café, featuring Mexican style food and best of all, friendly service. Property is well maintained, and owners are always on premises to insure happy guests and customers. 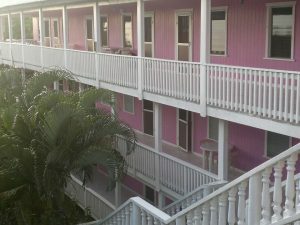 Sea Breeze Inn offers a total of 12 units, between rooms, studios and two bedroom apartments. Located right a the entrance to West End, Coconut tree is a small complex that includes 12 great cabins, a dive shop, a restaurant, a convenience store and even the dock where you can catch your ferry between West End and Utila! Rooms are comfortable, with private bathroom, a nice terrace with a hammock, and good a/c. Owner, Mr. Vincent Bush is fun to chat with. He can provide many stories about the island, as well as to what to see and do in Roatan. The cabins are just across the street from the beautiful Half Moon Bay beach. This is an extremely convenient location to enjoy one of the nicer beaches in the Bay Islands. Coconut tree is the easiest to find of all West End Hotels due to its location at the entrance to town! Probably the oldest continuously operating of all West End Hotels! A family run operation that is always innovating and improving their property. 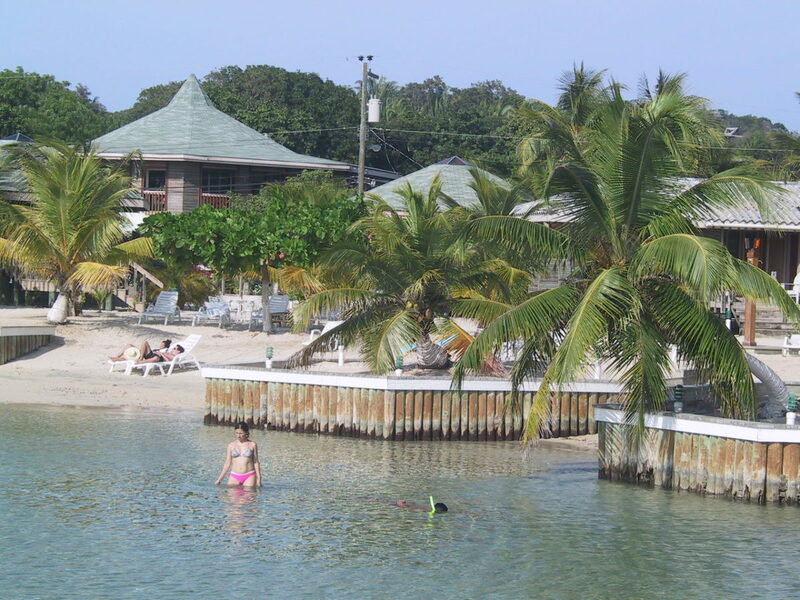 They offer freestanding cabins, some right on the beach in West Bay and others across the street from the beach. They are one of the few properties in West End that actually does have a beach. Located towards the south of the village, within walking distance to all the restaurants and bars, yet far enough to be away from the hustle and bustle of West End. Lost Paradise Inn is a great place to stay in West End! Very friendly service. Although not technically one of West End hotels, as it sits on the road as you drive from Sandy Bay to West End, it certainly is within walking distance. 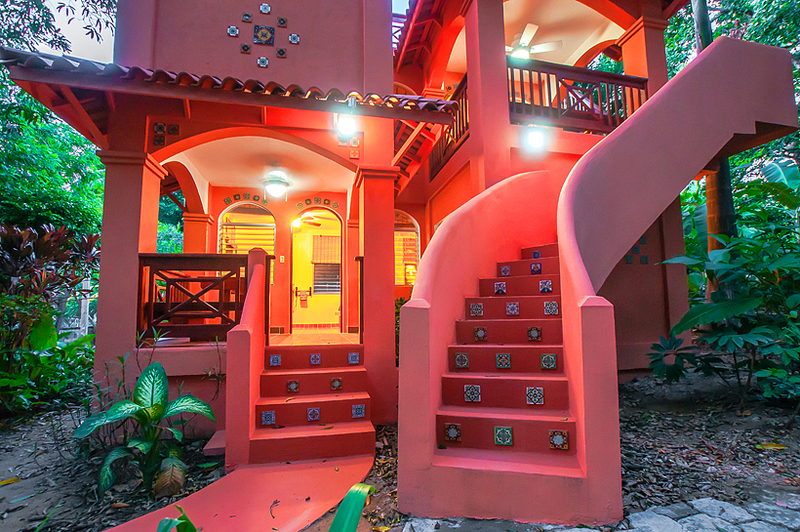 Villagio Verde is a lovely boutique bed and breakfast with beautiful gardens. Enjoy the privacy of your own cabin with access to a kitchen if you wish to prepare your own food. 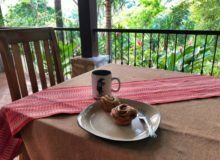 Ton and Zilla, the innkeepers are a friendly Dutch couple that decided to make Roatan their home. 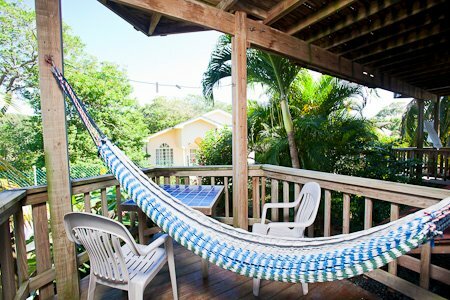 This small property gives you access to many of the different activities available on the island while providing you with a tropical oasis with lots of peace and quiet!